I’ve published the source code of the program I wrote for my tech talk at the 2011 PyDay conference. It’s a Python script and a companion C library that calculates and draws the Mandelbrot set. The objective of the tech talk was to show how to speed up Python programs using the power of native code. 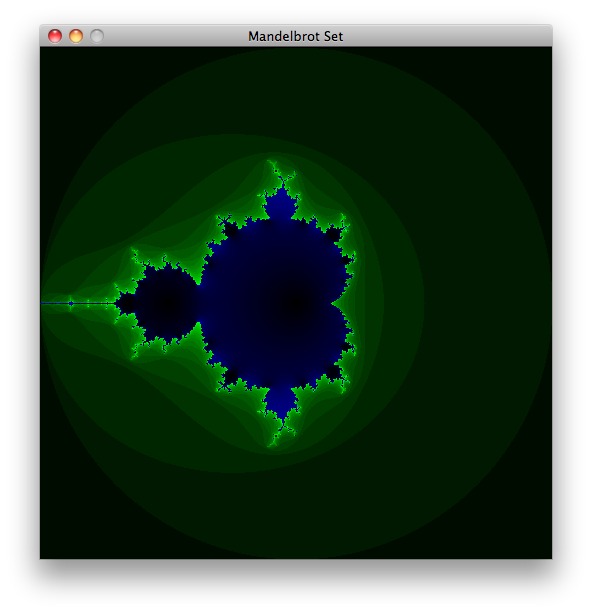 A render of the Mandelbrot set as performed by the mandelbrot.py script. Computations were performed in C.
What’s interesting about this program is that, although the core was written completely in Python, I wrote two compute backends for it: one in Python and one in C. The C code is interfaced with using the ctypes module. The results of running the program are shown in the screenshot above. If you are interested in trying it, the full source code is hosted in GitHub, here: https://github.com/alesegovia/mandelbrot. I’ve licensed it under the GPLv3, so you can download, run it, test it and modify it. As one would anticipate, the C implementation runs much faster than the Python one, even when taking into account the marshaling of objects from Python to C and back. Here’s the chart I prepared for the conference showing the specific numbers from my tests. These tests were performed to compare the run times at different numer of iterations, note this is a logarithmic scale. Comparison of the Python + C implementation vs a pure Python one. Scale is Logarithmic. 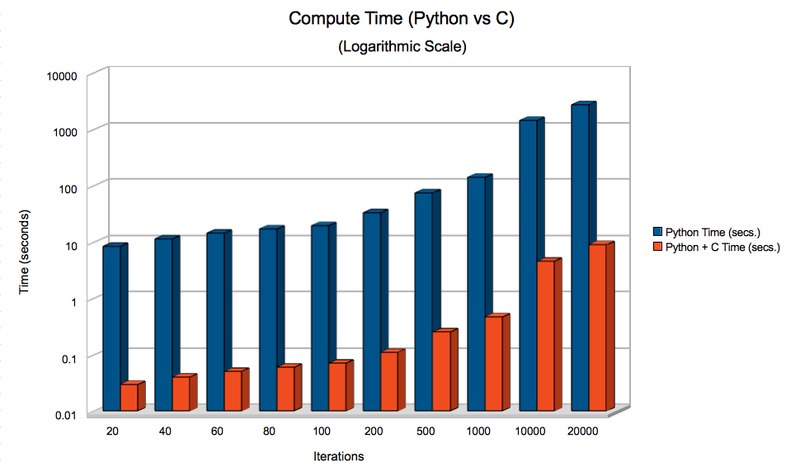 As you can see, Python programs can be significantly sped up using ctypes, especially when we are dealing with compute-intensive operations. It might be possible to speed up the Python implementation to improve its performance to some extent, and now that the source code is available under the GPL, you are encouraged to! I would always expect well-written C code to outperform the Python implementation, but I would like to learn about your results if you happen to give it a go. Objective-C, image taken from bigspaceship.com. I’ve been meaning to write about this for a while. It’s something that comes up rather frequently at work, so I though I’d write it down to organize what’s on my mind. Contrary to what many may think, the Java and C# languages are not based on C++ as much as on Objective-C. Indeed, Objective-C was a big influence in the design of the Java programming language. And since C# 1.0 was basically Microsoft’s Java, we shall consider it another derived language too. So, why do people think of Java as a C++-derived language? Java was built on C++’s syntax, this is why Java code “looks like” C++ code. 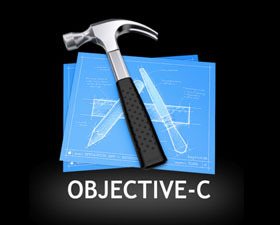 Java’s semantics, however, are heavily based on Objective-C’s. Interfaces (called “protocols” in Objective-C). Objects cannot be allocated in the stack. Garbage Collection (deprecated in Objective-C). All methods virtual by default (Java). int, float, double, etc. wrapper classes. Usually, this kind of urban legend stuff turns out to be completely inaccurate, but in this case, they are right on. When I left Sun to go to NeXT, I thought Objective-C was the coolest thing since sliced bread, and I hated C++. So, naturally when I stayed to start the (eventually) Java project, Obj-C had a big influence. James Gosling, being much older than I was, he had lots of experience with SmallTalk and Simula68, which we also borrowed from liberally. The other influence, was that we had lots of friends working at NeXT at the time, whose faith in the black cube was flagging. Bruce Martin was working on the NeXTStep 486 port, Peter King, Mike Demoney, and John Seamons were working on the mysterious (and never shipped) NRW (NeXT RISC Workstation, 88110???). They all joined us in late ’92 – early ’93 after we had written the first version of Oak. I’m pretty sure that Java’s ‘interface’ is a direct rip-off of Obj-C’s ‘protocol’ which was largely designed by these ex-NeXT’ers… Many of those strange primitive wrapper classes, like Integer and Number came from Lee Boynton, one of the early NeXT Obj-C class library guys who hated ‘int’ and ‘float’ types. So, next time you look at Objective-C thinking how weird its syntax looks, remember this story and consider how much it influenced the programming language landscape.